GTOS and coach and tour operators descended on Stratford- upon- Avon yesterday for a superb tourism set piece in the historic town. The Group Travel Marketplace event – arranged by Steve Reed Tourism Ltd of Hampshire – took place in the new Royal Shakespeare Company’s ‘The Other Place’ attraction. 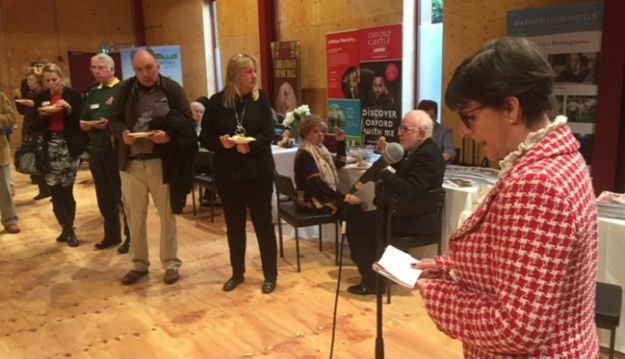 The event was coordinated in conjunction with the Arden Hotel; the Royal Shakespeare Company; Shakespeare’s Birthplace Museum; Shakespeare’s England; Compton Verney House and Gardens and many attractions from around the UK. ‘We were so pleased to have our event in such a prestigious and beautiful venue as ‘The Other Place’, says Steve Reed of Steve Reed Tourism Ltd. The Stratford event was the third of our three Group Travel Marketplace events – the others being at the Berystede Macdonald Hotel in Ascot and at Ena Mill Retail near Manchester. Plans are now afoot for another Steve Reed Tourism group travel roadshow event – this time in Plymouth, Devon, on Monday 18th April at the National Marine Aquarium.